A simple sweet sangria made with a white wine, apple cider, brandy, and fresh fruit. 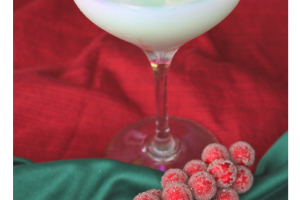 A fantastic holiday cocktail to bring to any Christmas party. Can you believe we are already a week into Christmas?! Which means we are 8 days into the 25 days of Christmas cocktails! I’ve enjoyed making all these different holiday party drinks. I’m enjoying the variety from fresh fruity cocktails to creamy dreamy dessert martinis. I am going to have a hard time choosing which drink to make on Christmas day! There’s something different about sangria compared to just drinking wine that make it so tasty! I think the whole flavors of brandy and apple cider along with fresh fruit all soaked in the goodness. You can add whatever fruits you like to your sangria. I choose to keep it seasonal and add apples and cranberries. You can also do oranges, strawberries, raspberries etc. The rosemary will add a taste to your drink, so it was totally optional. A delightfully fresh white wine sangria with brandy and apple cider and fresh fruits. 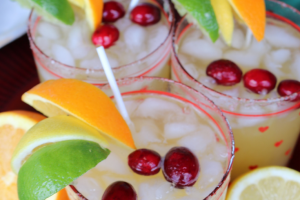 A fantastic holiday cocktail to bring to any Christmas party. 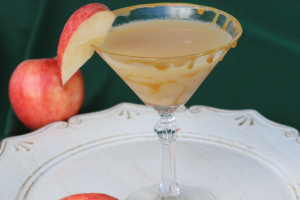 In a large pitcher, combine white wine, brandy, apple cider and sugar and stir to help sugar dissolve. Next, add in chopped apples and cranberries. Serve chilled with a garnish of rosemary sprigs. Make sure to get some of the fruit in every glass! Rosemary will give the drink a different taste. I recommend trying it without it and then with it to find your desired preference. You don't need a lot of it. If you are just tuning in for 25 drinks of Christmas, don’t forget to check out all the other Christmas party drinks. This is Day 8 of holiday cocktails so you have plenty left to enjoy! These drinks look delicious. Thank you I have pinned to try during the Christmas season. Thank you for sharing. Your drink recipes never cease to amaze me! Aww! Thanks love! I’m so glad you are enjoying them!